Heel pain is most often caused by plantar fasciitis -- a condition that is sometimes also called heel spur syndrome when a spur is present. Heel pain may also be due to other causes, such as a stress fracture, tendonitis, arthritis, nerve irritation, or, rarely, a cyst. Because there are several potential causes, it is important to have heel pain properly diagnosed. A foot and ankle surgeon is best trained to distinguish between all the possibilities and determine the underlying source of your heel pain. People with plantar fasciitis often describe the pain as worse when they get up in the morning or after they've been sitting for long periods of time. After a few minutes of walking the pain decreases, because walking stretches the fascia. For some people the pain subsides but returns after spending long periods of time on their feet. 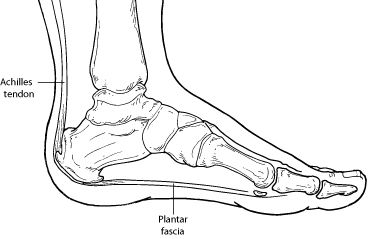 The most common cause of plantar fasciitis relates to faulty structure of the foot. For example, people who have problems with their arches—either overly flat feet or high-arched feet—are more prone to developing plantar fasciitis. Wearing non-supportive footwear on hard, flat surfaces puts abnormal strain on the plantar fascia and can also lead to plantar fasciitis. This is particularly evident when a person's job requires long hours on their feet. Obesity also contributes to plantar fasciitis. Ice. Putting an ice pack on your heel for 10 minutes several times a day helps reduce inflammation. Limit activities. Cut down on extended physical activities to give your heel a rest.